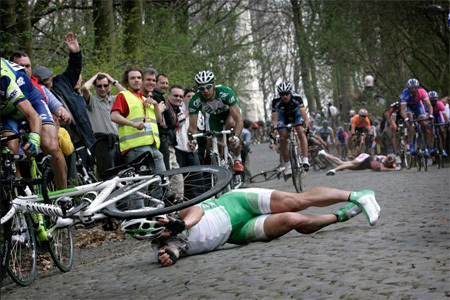 I have just come across these great pics of the mayhem on the descent of the Kemmelberg in Gent-Wevelgem. 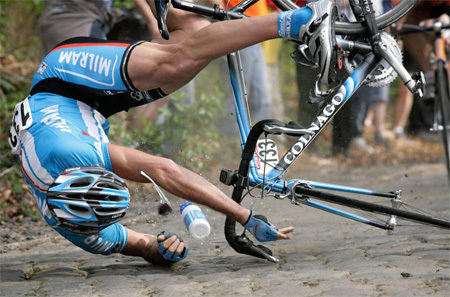 When Andrej Tchmil said this was the most dangerous place in cycling he wasn’t wrong. I had forgotten that Roger Hammond beat Oscar, not many can say that. By the way check out the thigh muscle on Marco Velo, the Milram guy! Thanks to La Derniere Heure for the photos. Marc Lotz rejected by PedalTech-Cyclingnews. Limburger Marc Lotz’s (34) verbal agreement with PedalTech will not now lead to a contract with the British team. They have apparently rejected Lotz, who copped a two year ban for EPO use in 2005 while riding for Quickstep, in favour of two more Brits. A miffed Marc commented that he hadn’t heard of either of them! 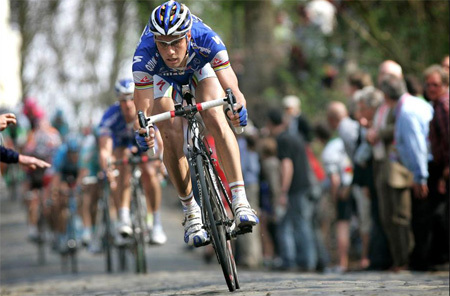 Before signing for Quick-Step Lotz had spent seven seasons with Rabobank winning just one race the Tour Du Haut Var in 2004. 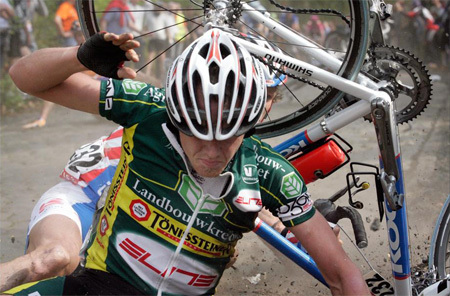 He was caught when the Belgian police raided his home in June 2005 as he was completing his preparation for the Tour de France. At that time he said he intended to retire and during his ban he worked as a maths teacher returning to racing in mid 2007 with a small team when his ban ended. 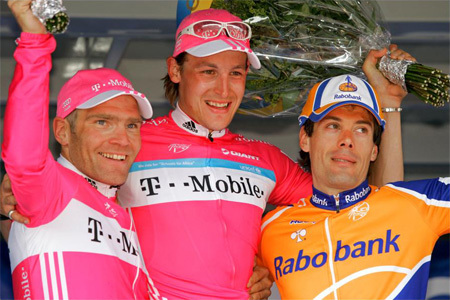 T Mobile started the 2006 tour with just seven riders, they were Andreas Klöden, Matthias Kessler, Patrik Sinkewitz, Michael Rogers, Giuseppe Guerini, Eddy Mazzoleni and Sergei Gonchar. In the individual time trial a week later Gonchar was the winner and T Mobile placed four in the first eight! If five riders went to Freiburg which two were left behind? Am I alone in failing to understand the economics of pro cycling? I believe that Pedaltech is an on-line bike shop based in Leicestershire. It is also now the title sponsor of the former DFL team. So presumably this means that ALL-TIME GREAT and team DS Eric Vanderaerden is on the payroll! What’s more Nico Mattan will have a role with the team and West Flanders Wonder Johan Museeuw supplies the bikes. Then there is general manager M. Dubois to pay. Plus the mechanic and probably a soigneur and driver. All from the profits of a UK bike shop ! For the first time I am soliciting comments, if you understand how this adds up please post a comment and enlighten me. Do you remember when Cycling magazine would contain reports on club dinners during the off-season? Well in celebration of that long-dead tradition I feel obliged to include something about the recent Southport CC 75th anniversary dinner. There were 190 guests having come from as far afield as the USA and Canada. Local star, by residence if not by birth, Bradley Wiggins had agreed to be the guest of honour but had to cry off as the event clashed with the Gent Six Day. To be honest I think Wiggo would have been better off going to the dinner! 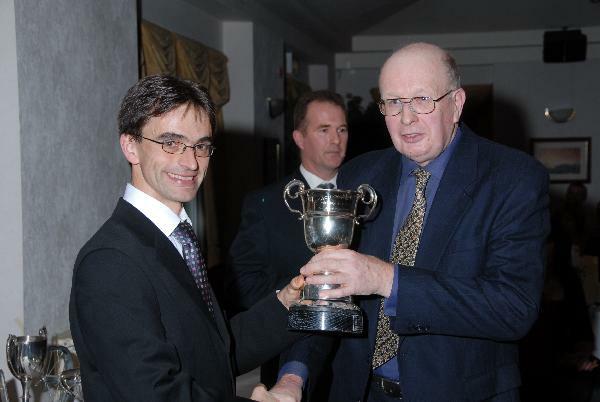 The prizes were instead presented by club member five times National Hill Climb Champion Jim Henderson. WARNING: I have to report, with great regret, that I have received a number of ageist comments about Champion Keenan. This shoddy behaviour will not be tolerated. Mr Keenan has been plodding away for more than five decades and this win is a well-deserved reward for his determination to continue trying despite his previous best result being a second handicap medal in a 1973 club 25. Greenjersey says Well Done Dr. John.